This page scrapes together some rough framework sketches, and floats them as a kind of architectural “kite”. It is intended to promote discussion. The diagrams are technical, but most of the text is aimed at the general reader. The exception is the rapid prototyping proposal, which is aimed at software developers. A registration framework is for identifying users and authenticating them as voters. The framework below is not yet designed, apart from some tentative draft requirements. What the sketch above says is that different locales (C City, R Region, and so forth) can maintain their own voter registers. They can also choose their own software for this purpose from any supplier. Each supplier's register component is plug compatible with those of other suppliers, so they all work together in a coordinated fashion. Coordination is necessary so that voters can register at the local level, and be authenticated just once, yet vote in all polls (municipal, federal, and so forth)..
Not only the voter registers are plug compatible, but also the pollservers. So C City might be using a Liquid Feedback pollserver, while R Region is using an Adhocracy pollserver and D City is using both (not shown). Voters in D City would therefore have a choice of which pollserver to use. A voting framework is for casting votes and viewing results across the pollservers of multiple, competing suppliers. No voting framework has yet been designed, but the following use cases have been proposed. In this example, the autocaster is deployed as a component alongside the destination pollserver. It depends on the vote posting interface of the source pollserver (A) to discover original votes, and the poll identification interface of the pollwiki (right) to establish poll equivalence. 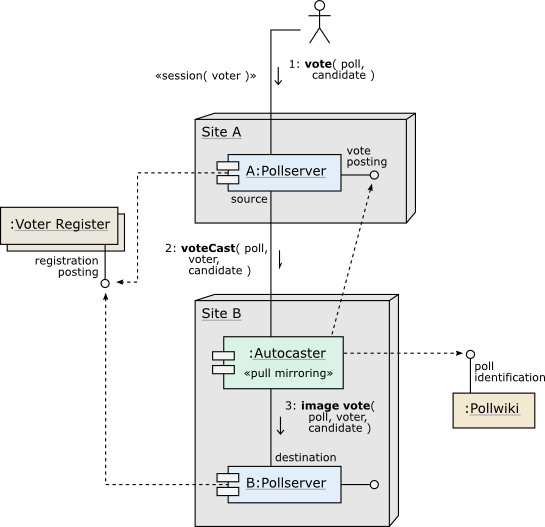 Having discovered a newly cast vote on the source pollserver, the autocaster translates from source poll to destination poll, and creates the image within that context on the destination pollserver (B). The user might now switch from A to B. Because both pollservers share a common voter register (left), her identity as a voter is unaffected by such a move. She would find her votes mirrored as expected on B, and could pick up where she left off. The diagram above shows only part of the picture. Site A also has an autocaster of its own (not shown). It too is pull-mirroring votes, in this case from B. Mirroring therefore works in both directions and both pollservers end up with the same votes. Likewise for all the other pollservers whose polls are equated by the common poll identification interface. The user may freely range across all of them, and make an informed choice of which to use on a more permanent basis. Personal vote filtering enables the user to "dial up" customized results by selectively filtering a pool of votes. Effectively, the user compiles her own voter list and conducts a recount. This use case is poorly described, at the moment. For more information, see User:ThomasvonderElbe_GmxDe/Vote mirroring#Personal_vote_filtering. A difference bridge is a text comparison server for deliberative democracy. It puts backbone into online deliberations by grounding them in concrete differences of position. It works in conjunction with peer-to-peer voting and drafting media, wherein the positions of voter and candidate are already formalized as text documents. In this setup, disagreements and misunderstandings are easily visualized as differences of text. The difference bridge goes a step further in allowing any particular difference to be referenced by a Web link, suitable for embedding in an online discussion. Participants may follow the link in order to summon a precise, stable view of the difference. Thus deliberations are formally anchored, at points, to the objects under discussion. 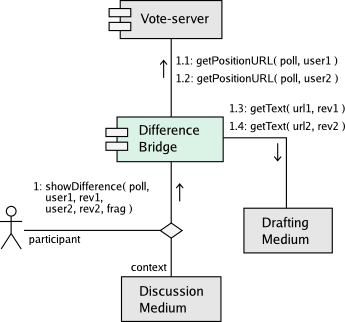 Additional features of the difference bridge allow for locating other discussions of the same object across multiple forums; tracking the number of co-voters who share the same particular difference; and resolving differences by text merger. The difference bridge and framework are currently under design.6 What the sketch above says, basically, is that no matter what pollserver is available to the voters, and no matter what difference bridges, discussion media and drafting media they choose to use, the same, basic difference services will be available. So the voters are free to choose their own tools. A classification framework is for categorizing polls and positions, and creating navigable views. The diagram below is a paper-napkin sketch, with no real design behind it. We can at least forsee that classification is likely to require data input from most of the core components, as well as the voters. pollservers query the poll-classifier wikis and cross-mirror the equivalent polls. We have implementations of the trustserver (2) and the mirroring parts (4,5). As of January 7, we have a trustserver (2) serving a testwiki (not quite a #1, yet) where users are entering registration and trust information into their user pages (such as this user page). The calculated trust levels then end up in other wiki pages (such as this street page). More information is available here, along with the current data: http://reluk.ca/system/host/t/home/v/votorola/out/votrace/. We still need to set up a proper streetwiki (1); get the first pollserver to actually use the common registration data (3); and set up classification and cross-mirroring for all polls (6,7). Users set up a federation of semantic register-wikis (streetwikis). Steps (1 and 2) are a temporary hack for a chainable set of mutually tight residential registers. Users set up a semantic streetwiki for each city or region that wishes to participate. They may use a free host like referata.com. The registers must be geographically disjoint (non-overlapping) in jurisdiction. Each street is given a separate page in the wiki, and each block a separate page section. Intersections are linked to cross-street pages, so users may easily "turn corners" as they navigate through the neighbourhood. Blocks contain buildings, and buildings contain residents. Each resident is linked to a user page. On each user page, the user may extend trust edges to other users. She may also extend doubt signals. Templates are provided for these. Obtain the registration and trust data from the streetwiki (1), via a semantic query. Post the registration list to the Web. Write the trust levels back to the streetwiki as multiple semantic properties of a single protected page. Local queries may reference the trust levels and show them to users, but users may not alter them. Recompile the registration list periodically, as needed. pollservers read the registration lists and compile their voter lists. This is a temporary hack for the list compiler. Copy the registration lists from the trustservers (2). Chain the registration lists together and translate them to the pollserver's native voter-eligiblity format. The result is effectively a voter list for that pollserver. Its content will be equivalent to that of the other pollservers' lists. Recompile the voter list periodically, as needed. Create a new poll (aka. "issue"). Post the vote list to the Web. Re-post the vote list periodically, as needed. Copy the vote list from the source pollserver. Translate each original vote to an image vote in the destination pollserver's native format. Re-pull the vote list periodically, as needed. Users create a separate page for each issue that is being addressed within the wiki's jurisdiction. For each issue, users identify the polls that address that issue. Thus poll equivalence is established across all pollservers. 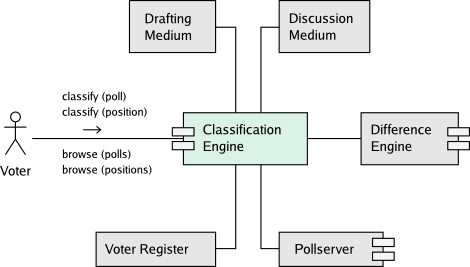 Cross-correlate the polls of the local pollserver with those of remote pollservers, via a semantic query issued to the classifier wiki (6). Configure the autocaster for each local poll (5), such that the votes of the equivalent remote polls are mirrored. Re-correlate and re-configure periodically, as needed. 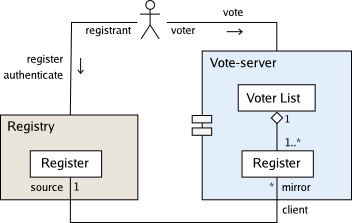 The shared voter registrations (1,2,3) will enable users to wander from pollserver to pollserver, without restriction. The vote mirroring (4,5,6,7) will effectively pool their votes across all pollservers. Thus free-range voting may be implemented as an extended-alpha prototype. Users may then vote up system policies, rules, plans and designs — and elect system administrators, registrars and other officials — even while the system is being developed and deployed. Architecture - Aborted design attempt. Project plans for Votorola - Rough outline of current protyping efforts. Registration framework - Common standards for identifying users and authenticating them as voters. Streetwiki The design of the residential voter register, in particular streetwikis, neighbourhood trust networks and trustservers. Vote mirroring - The enabling technology for free-range voting. Our approach in the present document is based on the definition of large-scale frameworks and components. By contrast, EML, OPOL and xDebate take a bottom-up and data-centric approach. Election Markup Language (EML) XML schemata for traditional elections. The top-level design of a system. A collection of frameworks. 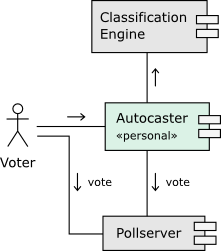 A large-scale part of the system, such as a pollserver (Adhocracy, Liquid Feedback, Votorola, etc.) or drafting medium (MediaWiki, MixedInk, etc.) or discussion medium (mailing list, Web forum, etc.). A set of written standards that says how various components work together in order to provide a coordinated function. So there is a framework for the function of voter registration, coordinating local authentication and global voting; another framework for position differencing, linking discussions of the same differences across multiple forums; and so forth. An architecture that provides its users with the widest possible range of tool choices. A collection of frameworks that is 1) public; 2) free of intellectual property exclusions; 3) extensible; and 4) compatible with the widest range of actual component designs, from all suppliers. A functional scenario from the perspective of the user. A way of using a system. ^ Many of the suppliers who compete in e-democracy are open projects, staffed by people who volunteer their time without pay. This is perhaps another reason to strive for inclusive frameworks. On an individual basis, the costs of exclusion from a closed or arbitrarily restrictive framework can be high. ^ Free-range voting was originally proposed in the context of vote pooling, which is less effective than mirroring. See the mailing list of the Metagovernment Startup Committee; in particular this thread for context, and this for cross-pollserver pooling. See also the later wiki writeup. Marko A. Rodriguez, Daniel J. Steinbock, Jennifer H. Watkins, Carlos Gershenson, Johan Bollen, Victor Grey, Brad deGraf. 2007. Smartocracy: social networks for collective decision making. 40th Annual Hawaii International Conference on System Sciences (HICSS'07). ^ On personal autocasting, see also: http://lists.electorama.com/pipermail/election-methods-electorama.com/2011-October/028818.html. ^ The sketch of the difference framework is from User:Mike-ZeleaCom/p/de. Thomas von der Elbe contributed to the initial discovery, and Martin Häcker to the early design. ^ The rapid prototyping idea came out of discussions with David Bovill and Thomas von der Elbe, in December 2009. ^ For more information on vote mirroring progress, see this thread, especially Thomas's post on the 29th. ^ Timestamping of exported votes allows for older originals to be replaced by newer images. ^ Mark Murphy. 2008. The “killer app” of public participation. In Rebooting America. Edited by Allison Fine, Micah L. Sifrey, Andrew Rasiej and Joshua Levy. Personal Democracy Press. http://rebooting.personaldemocracy.com/node/5499. See also his later comments in the mailing list of the Metagovernment Startup Committee, February 2009. ^ Mark Murphy. 2007. xDebate formats specification, version 0.1. Not yet published.